For computer science major Marla Louissaint, singing is in her blood. 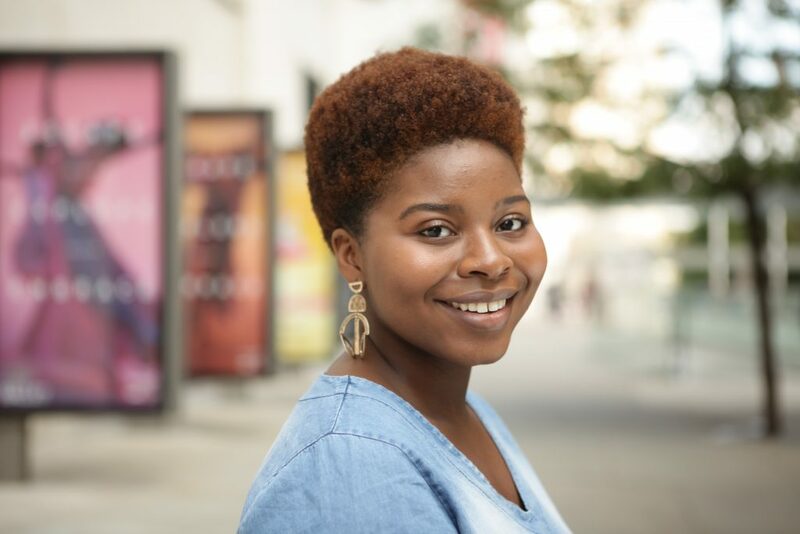 The Fordham Founder’s scholar is currently on the national tour of the Broadway show Beautiful: The Carole King Musical. The tour started last fall, so the Fordham College at Rose Hill junior had to take exams to complete the semester between rehearsals, performances, and travel. Louissaint said she was grateful that her professors worked with her to coordinate her classwork remotely. She finished papers, read e-books, and persevered with the support of her fellow cast members. With 19 one-week performances underway this spring, Louissaint has taken a leave of absence this semester. But despite the lure of the professional stage, she has no plans to abandon her education. While her parents are very supportive of her artistic endeavors, she said, they want to make sure she’s educated in a field that’s not as volatile as the arts. Having not had the chance at a college degree themselves, her parents see the value in a foundational education, she said. “My family wants me to have a more solid career, something else that can help support us,” she said. Louissaint was raised in the Washington Heights neighborhood of Manhattan, near 158th and Amsterdam Ave. The extended family lives in the same neighborhood: Louissaint’s grandmother lives downstairs and her aunt lives next door. Louissaint helps pay for her grandmother’s rent as well as her own college tuition. Before landing the role in Beautiful, she worked desk jobs as a temp in various companies. “My family can’t help me out, and a girl’s gotta eat,” she said with a laugh. While on tour, Louissaint’s typical day starts with breakfast and a walk around whatever city she’s touring in. She then makes her way back to the hotel to warm up her voice for 20 minutes or more, “depending on how long that cast was out on the town the night before,” she said. Then it’s off to the gym for a couple of hours before the show. “It’s important to condition my body, especially if I have to dance to the song ‘Locomotion’ once, sometimes twice a day,” she said. Every day she says she sets aside time at lunch to call family back home. “I find a cute cafe to eat in and get to dialing my mom, dad, sister, grandmas, and everybody I haven’t heard from in a while,” she said. Even though she’ll be on tour, Louissaint said she’ll be at the Fordham Founder’s Gala on March 19. She looks forward to seeing her family, and reassuring them that she’s still committed to getting her degree. While Louissaint said she was always proficient in math, she said she didn’t discover her acting talents until she was a junior in high school. There, she won a best actress award in The National High School Musical Theater Awards. She got an agent and was soon performing off-Broadway opposite James Earl Jones in God Bless You, Mr. Rosewater. While it may seem that her chosen fields of theater and computer science have little to do with each other, she said she sees the connection. “You always have to use creative thinking [in both]acting and writing code,” she said. Another similar factor, she said, is staying power. If something goes wrong onstage, the show must go on. She said the same persistence is required in writing code. “It’s fight or flight in both fields,” she said.